The concert will feature Headies 2014 Rookie of the Year, Reekado Banks, Dammy Krane and Rayce, as well as Mavin artiste, Di’ja, Femi Naija, Pepenazi and Poe. Hosts are Kel of Wazobia TV and Sensei Uche of City FM. 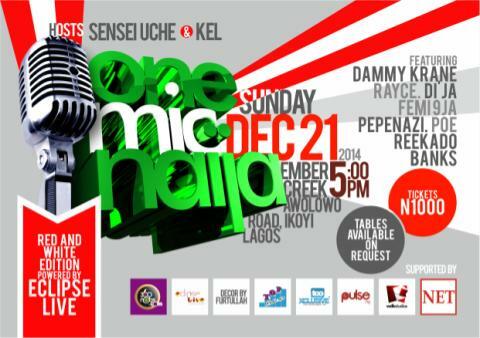 One Mic Naija will hold at upscale event centre, Ember Creek on Awolowo Road, Ikoyi, Lagos. There will be an open mic session for audience members to show their skills and there is N50,000 up for grabs. One Mic Naija is a bi-monthly concert, tagged “Naija’s Coolest Concert series” and creates a live experience like never before for guests.